Find our most popular New Jersey corn mazes with information on locations and activities near Newark, Trenton, Cherry Hill and Atlantic City. And don’t forget about the other fall activities that occur on these farms including pumpkin patches, hayrides, farm animals and children’s activities. It’s one of the best parts of September and October! Horse Sleigh Farm – Washington, New Jersey. Fall farm harvest fun from mid-September to early November. They have a 20 acre pumpkin field with scenic hayrides. Pick your own squash and gourds as well. Pumpkin painting and carving, 10 acre corn maze split into small and large maze, corn cannon, water buffalo, petting animals, gem mining, bouncy house, corn box and pony rides. Haunted attractions like the haunted corn maze, hayrides, barn and trail of terror on Friday and Saturday nights. The address is 438 Route 57 West, Washington, NJ 07882. It is about 48 miles north of Trenton. Horse Sleigh Farm is so much more than a 16 stall horse stable and horse farm area. It is well worth the drive to visit. Donaldson Farms – Hackettstown, New Jersey. A fifth generation family farm operating for over 100 years. It has Pick-Your-Own-Pumpkins, gourds and indian corn daily from late September through Halloween. Hayrides to the patch available on weekends. Corn maze takes an average of 25 to 45 minutes. Corn cannon, farm animals and farm market. The address is 358 Allen Road, Hackettstown, NJ 07840. It is located 44 miles west of Newark. Heaven Hill Farm – Vernon, New Jersey. Wemrock Orchards – Freehold, New Jersey. A second generation family farm and country store. Their country farm market is famous for their handmade pies. U-pick pumpkins, hayride and inflatable bounce for visitors in the fall. Patch is open weekends starting the last weekend in September until Halloween. 5 acre corn maze is also per person. See if you can find all of the clues and solve the maze challenge. Munchkin Fun Patch crafted for children under the age of five with pumpkin checkers, pumpkin bowling and other games, apple cider and apple cider donuts. The address is 100 Wemrock Rd., West Freehold, NJ. It is about 39 miles south of Newark. Argos Farm – Forked River, New Jersey. Start pumpkin picking off the vine. No admission fee to the patch. Other activities include four acre cornfield maze, hay ride, jumping pillow, pig races and cow train rides. The address is 1250 Lacey Road, Forked River, NJ 08731. It is located 48 miles north of Atlantic City. The McCann’s Farm – Monroeville, New Jersey. Pick your own pumpkins with all sizes available for one price starting in late September. Enjoy the corn maze, wagon rides and farm animals. They are a third generation farming family in Elk Township, thirty minutes from Philadelphia. The address is 1065 Aura Rd., Monroeville, NJ 08343. It is about 24 miles south of Cherry Hill. Hillsboro Farm – Hillsborough, New Jersey. Fall activities on weekends from late September through Halloween. 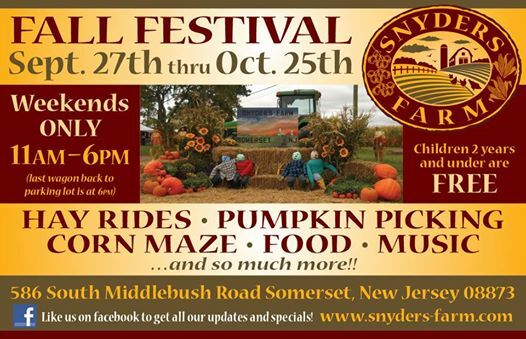 Enjoy pumpkin picking, hayrides, corn maze, face painting, pumpkin decorating and scarecrow making. Originally a dairy farm started in 1867 by the Van Nuys family, it now produces farm fresh produce and fun for guests. Located south of Bridgewater and west of New Brunswick. The address is 219 Hillsborough Rd., Hillsborough, NJ 08844. It is about 24 miles north of Trenton. Terhune Orchards – Princeton, New Jersey. A 200 acre fruit and vegetable farm. Pick your own pumpkins at the Cold Soil Rd location. Apple picking at Van Kirk Road Orchard. 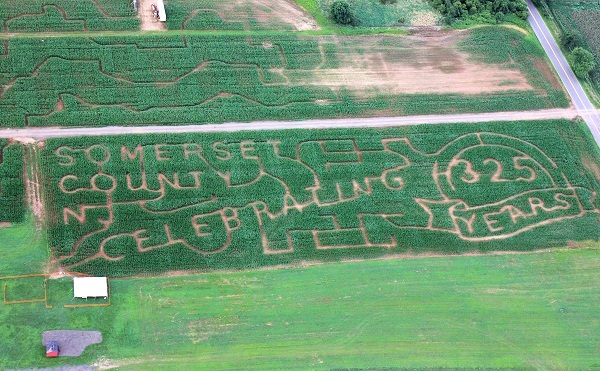 Fall festival starting in September with seven weekends of family farm fun. Activities include, pony rides, tractor drawn wagon rides, pedal tractors, barnyard animals, pumpkin painting, hay bale maze and corn stalk maze. The address is 330 Cold Soil Road, Princeton, NJ 08540. It is about 12 miles north of Trenton. 2 phases to the corn maze. Weekdays including hayrides, pick your own, and lots of kid friendly family fun. They have a straw jump, rubber duck races, pumpkin bowling, pumpkin checkers, a moon bounce, a kiddie corral, a junior pedal cart course, farm animals, a bee hive, and bouncy balls. Thanks for putting us on the list. We are now closed for the season but I wanted to let you know that our 2013 maze was an Oregon Trail theme. I tried to paste a picture here but it wouldn’t insert it so you can find it on our website at http://www.etschfarms.com We will re-open mid September 2014; Look for our info at our website and on our Facebook page.